TrackingTrump.com - Pence: Make Hot Dogs Great Again! WASHINGTON (AP) — Republican vice presidential nominee Mike Pence has noshed on a hot dog with chili sauce before a campaign stop in northeast Ohio. Pence, his wife Karen and daughter Charlotte made a quick stop at Jib Jab Hot Dog Shoppe in Girard, Ohio, on Wednesday before an evening rally in nearby Leetonia. Pence ordered a hot dog with chili sauce and scarfed it down in just a few quick bites in one of the restaurant’s booths. Pence then chatted and posed for pictures with diners and restaurant staff. Pence was campaigning in Ohio after spending the morning and previous afternoon in private debate preparations in Wisconsin with Gov. Scott Walker. Republican vice presidential nominee Mike Pence orders a hot dog with chili sauce from the Jib Jab Hot Dog Shoppe during a campaign stop in Girard, Ohio, Wednesday, Sept. 28, 2016. 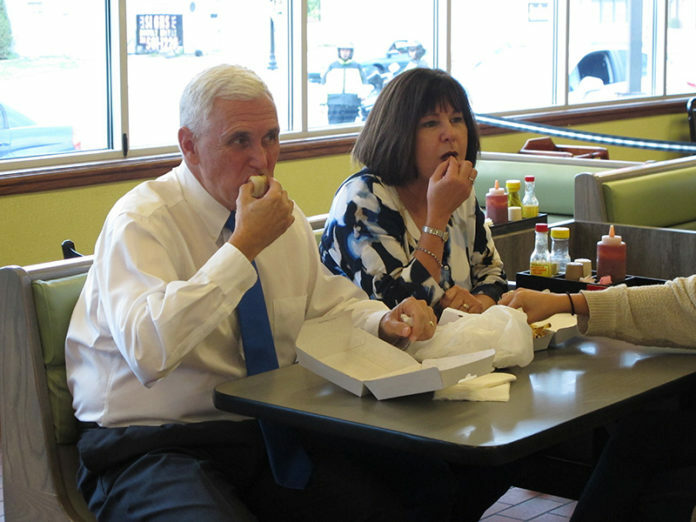 Republican vice presidential nominee Mike Pence, sitting next to his wife Karen, eats a hot dog with chili sauce from the Jib Jab Hot Dog Shoppe during a campaign stop in Girard, Ohio, Wednesday, Sept. 28, 2016. Republican vice presidential nominee Mike Pence speaks with diners after eating a hot dog with chili sauce at the Jib Jab Hot Dog Shoppe in Girard, Ohio, yesterday.